Digital Single Lens Reflex (DSLR) cameras are the fastest growing segment in the digital camera market. Manufacturers have made the latest generation of DSLRs more enticing by making them smaller, lighter, and more user friendly. That coupled with the drop in prices has convinced everyone from scrapbookers to advanced amateurs to switch over. This four-part guide is an overview about what to look for in a DSLR and answers common questions for first time buyers. A common misconception about a DSLR is that there is a much higher learning curve. Most of today’s entry level to advanced amateur DSLRs offer the same amount of automation found in a compact point and shoot camera. In other words, if you are the type of user who only uses the fully automatic modes then you can continue to do so. Most first time users will find that DSLRs are not only easy to use but they get rid of that annoying delay between pictures found in compact cameras. Some 35mm SLR users are also reluctant to make the switch because they fear that they will have to re-learn everything for digital. The core functions of exposure (aperture, shutter, and ISO) are exactly the same as they were on film. Even though there are some “new” functions, most of them are designed to make it easier to get the shot you want. A perfect example is white balance: instead of having to buy color correction filters or film, you can simply tell the camera the type of light you’re in and it will correct it. Users may be intimidated by the different file formats (more on that later) and having to edit everything but to put it simply: if you don’t want to edit the images you don’t have to. You can shoot everything in the camera and then take it to your lab to get processed just as you would with 35mm film. The best part is you only have to print the ones you want. Will my 35mm lenses work? If you own an autofocus 35mm SLR then it is very likely that your lenses will work. Canon, Nikon, Pentax, and Minolta (now under the Sony brand) all use the same mount for their DSLRs as they did for their 35mm autofocus camera. In the case of Pentax and Nikon you might be able to use some of the manual focus lenses with some restrictions depending on the model. The easiest way to find out if your lenses work is to bring them down to your local dealer and mount them on the camera. There is going to be a slight change to your 35mm lenses when using them on a DSLR body. When using your lenses the field of view will be 1.5 times (1.6 in the case of Canon) the given focal length. The reason for this is the size of the sensors in most DSLRs are smaller than a piece of 35mm film. These sensors are called “APS-C sensors” because their size is approximately that of a piece of APS film. What this means is if you are using a 50mm lens on a DSLR body, the equivalent field of view of that lens in 35mm terms would be 75mm. There are some cameras on the market that offer a chip that is the size of a piece of 35mm film called a “full frame sensor.” This size sensor is only found in professional cameras like the Canon EOS 1Ds (not 1D) and 5D series, and the Nikon D3. An important thing to keep in mind is having an APS-C sensor size does not make your lenses longer. You are simply seeing the center portion of the image circle which narrows your field of view. This will help you on the telephoto side but hurt you on the wide side. That means if you have a wide angle lens, you might need to buy a new lens to get that same field of view. 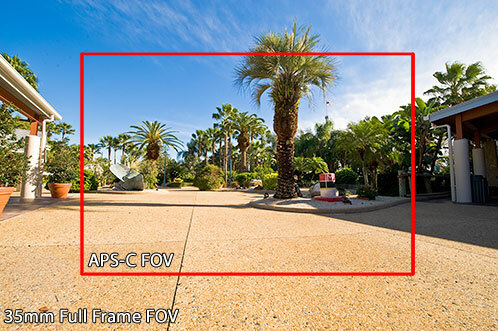 Below is an example of what a wide angle lens would look like on a full frame camera vs. an APS-C sized sensor. 14mm Lens: Full Frame Sensor Field of View vs APS-C Sensor Field of View. If you have lenses, I recommend bringing them to a local dealer to evaluate whether or not it is worth your money to keep using those lenses or to upgrade them. If you just have the kit lens from your 35mm camera (usually a 28-XXmm), I would recommend upgrading it to the kit lens included with the DSLR because it’s most likely going to be designed to give you a better starting range than what your old lens would provide. Lens choice will be discussed further in the guide.